It's very exciting to see people come into my shop with clear faces after a week of using my scrub. It isn't just helping my face but making a significant difference for people suffering from acne. Yay! 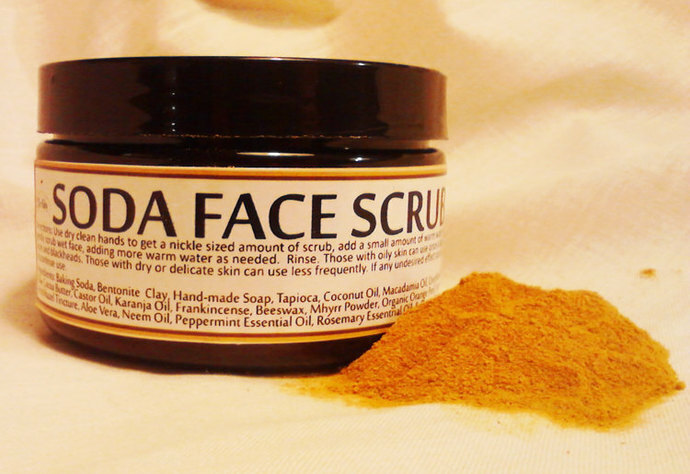 This face scrub makes my skin feel clean and exfoliated without dryness or harshness. There's a peppermint zing that makes my face happy. And I like the smooth softness it gives my face. And dead skin, bumps and dry patches seem gone and I feel I've stopped those blackheads without putting my face through extremes. While I don't worry too much about acne at my age, I still get a few pimples but the Neem and Tea Tree, with Coconut Oil is a great gentle, skin safe, disinfectant. I posted a picture of my face as of today in the pictures of the Soda Scrub. 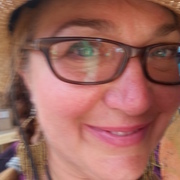 I am 51, I use the soda scrub in the morning with my bath, the Oil Cleansing Treatment at night and the Face Serum at night. My nose is a little red because I walked my dog (Gidget) without my sun screen this morning. The baking soda is much gentler for me than scrubs containing apricot shells, seeds or salts. I include an organic peppermint soap that I find uplifitng and not drying. Gone is that tight feeling other cleansers give me, probably because of the nourishing oils. The baking soda helps keep the product from getting contaminated. So I think this is a very cost effective cleanser. One bonus is, I don't get bits of seeds or grains left in my hair or ears. There's no waxy, filmy or sticky residue left on your face to block pores like I've found with some exfoliating scrubs. The smell is natural, not fruity or fake, just smells like the necessary ingredients to wash my face nicely. Baking Soda, Bentonite Clay, Hand-made ZirYab's Liquid Soap, Tapioca, Coconut Oil, Unrefined Shea Butter, Organic Cocoa Butter, Castor Oil, Karanja Oil, Neem Oil, Organic Hemp Oil, Frankincense Powder, Turmeric Powder, Myrrh Powder, Organic Orange Peel Powder, Witch Hazel, Aloe Vera, Peppermint Essential Oil, Rosemary Essential Oil, Orange Essential Oil, Tea Tree, Non-GMO Vit E.